It’s back! 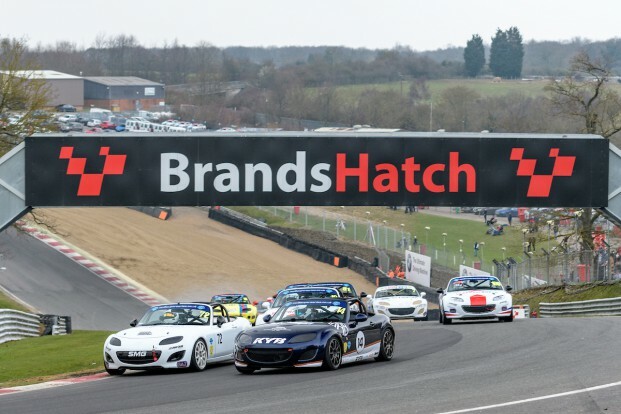 Five months since its 2018 closer at Donington Park, the sister race series to the BRSCC ‘s Mazda MX-5 SuperCup kicks off in earnest at Brands Hatch on Saturday. Over the cold winter months, dedicated drivers and teams have been busy getting their racy roadsters ready for the challenge this weekend will bring. The first of eight triple-header Super Series meetings will see 23 entrants, including many new names and 13 ‘masters ‘drivers, competing at the iconic British circuit. A number of drivers have carried over from last season for their second season in the Mk3 MX-5 here. For those who are no stranger to them, the likes of Jeremy Crook and George Grant will certainly feel right at home once again, especially for Jeremy having taken an impressive couple of podiums. Surely the aim now has to be to go on and take his first Super Series victory, but the challengers will be lining up to try and stop him. Sam Bailey will certainly be one of them, having been a constant amongst the top 5 runners all year last season. Having picked up Tom Collins’ ex-SuperCup car at the end of last season and debuted it at the finale at Donington last October, he will be keen for his new mount to serve him well in the opening rounds this weekend. Another driver who has nothing but upwards progression on his mind is Bradley Kent, the brother of TCR UK star Lewis. Having spent most of last season getting to grips with rear wheel drive after his previous experience had only seen him race front wheel drive Fiestas at both junior and senior level, Bradley slowly but surely found more and more pace. With the help and guidance of older brother Lewis, he’s sure to be a factor this year. Also expected to be in the mix will be James Kell, who will use the Super Series to dovetail a campaign in the Michelin Ginetta GT4 SuperCup. James impressed many with the amount of progress he made throughout 2018, even clinching his first podium finish towards the end of the year. Perhaps this year could also be a breakout season for him as his Ginetta commitments will certainly help him build his pace and confidence further. MX-5 Championship converts Matt Pickford and Russ Lindsay will also be on the grid this year, as will fellow Mk1 stalwart Clive Powles who tried his hand in a Mk3 at the final rounds of the SuperCup in 2017; he will drive a Tucker Motorsport prepared car this year. Former Formula Ford racer Simon Fleet can’t seem to keep away as his pink and blue #21 will also make an appearance for yet another season, as will Boreham Motorsport’s Jim Hart and Xavier Brooke, plus last season’s Super Series Rookie of the Year Liz Walton enjoyed herself so much in 2018 that she also wants another go too! That’s the list of familiar names, but what about the new boys and girls? James Kell’s father Darren will join his son on the grid, as will Joseph Marshall-Birks who made a couple of appearances last year and is the son of new series sponsors Marshall & Co Chartered Accountants. Long term Mazda supporter Ray Worley is signed up for this season, but new blood comes from his daughter Jude as she too will take to the track to race with her father, having also made a one-off appearance at Donington last year. 16-year-old karting ace Declan Lee begins his circuit racing career with us this season, while James Swann-Dixon commits to double duty of racing a Mazda and in the Caterham 310R Championship in the same year. Cameron Thompson comes back to MX-5s after a brief spell in the VW Cup, former FunCup driver Chris Webster makes his Series debut this weekend and both rally driver Dale Crowsley and Stuart Willson also appear on the entry list for the opening rounds this weekend. This time last year, British GT racer Sam de Haan made a one-off appearance in a bid to gain licence signatures ahead of the opening rounds, and this weekend another driver has the same task ahead of him. Former British Rallycross Championship frontrunner Nathan Heathcote is making a switch to circuit racing in Ginettas this year and will compete in the two races on Sunday, missing the first race on Saturday due to other racing commitments elsewhere at Oulton Park on the same day. Not present at Brands this weekend, but set to appear later on in the season is former CSCC racer Natalie Brookes, who swaps her most recent mount of a Ford Fiesta to drive a Brisky Racing MX-5 previously driven by Simon Woods. Welsh Saloon & Sports Car racer Simon Hutchings will also be present on the grid at some point later in the year. It will be encouraging for some, to learn that Jake Bailey and Josh Jackson, the two frontrunners who dominated proceedings last year have moved on - opening the door for whoever will be the star of 2019, to shine. Join us at Brands Hatch to witness the biggest ever line-up for this exciting race series.